overview of SDI 2200, an automatic, on-line and unique control and monitoring system, designed for continuous, unattended operation in desalination and other water treatment plants. 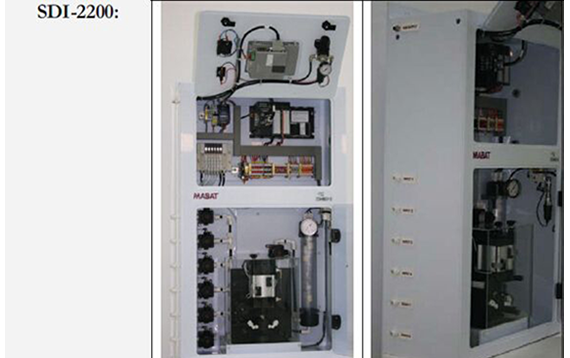 The Mabat-SDI 2200 is an automatic, on-line and unique control and monitoring system, designed for continuous, unattended operation in desalination and other water treatment plants. The Mabat-SDI 2200 is used in critical water quality applications, where precise control is essential for safe and economic operation. It replaces the manual, error prone, conventional procedure with an automatic, precise and infallible routine. The Mabat-SDI 2200 is a complete self-contained system intended for unattended operation with extensive reliability and advanced fault analysis and warning treatment. The SDI is calculated by measuring the required time for a fixed volume (500 or 100 cc), under constant pressure, to flow through a filter paper rated at 0.45 micron. The measurements are done twice during the cycle. First time (Ti Initial Time) when the filter is new, and second time (Tf Final Time) after the filter is exposed to the same flow condition for a fixed time (Tt Check Time). Ti: Time required to collect the first constant volume (500 or 100 cc) of sample. Tf : Time required to collect the same volume after Tt has expired. Tt: Total flow time in minutes (usually 1-15).